Sometimes I wonder what it’s like to be the type of blogger who plans out recipes. I picture her sitting in a clear acrylic chair just off her kitchen at a built-in desk with various Pottery Barn dry erase calendars and magnetic boards above her head, sipping a latte while casually writing a post on her MacBook Air about how perfectly her Saturday Morning Chocolate Soufflé came out of her double-oven just minutes prior. She schedules it to publish the following Saturday at 7:45 a.m. because she’s already got this week’s posts lined up so that perfectly fluffy and not about to deflate soufflé will just have to wait it’s turn. She’s organized and she’s probably getting compensated by Ghirardelli for the whole damn thing. If any of those thoughts cross your mind whenever you scroll Instagram or Pinterest and spot a too pretty to eat food photo, then get out of my head because we are the same person. Truth is I’m sure those bloggers exist. I’m even more sure that I am not one of them. 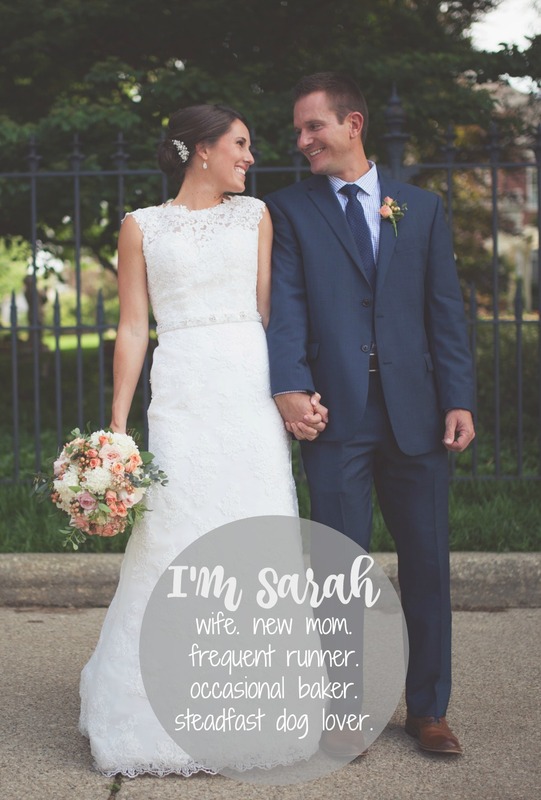 Let me walk you through the Sarah stages of recipe post planning. Sunday, July 3rd, 10:28 p.m. Friend sends you a picture of her American Pie. Literally. 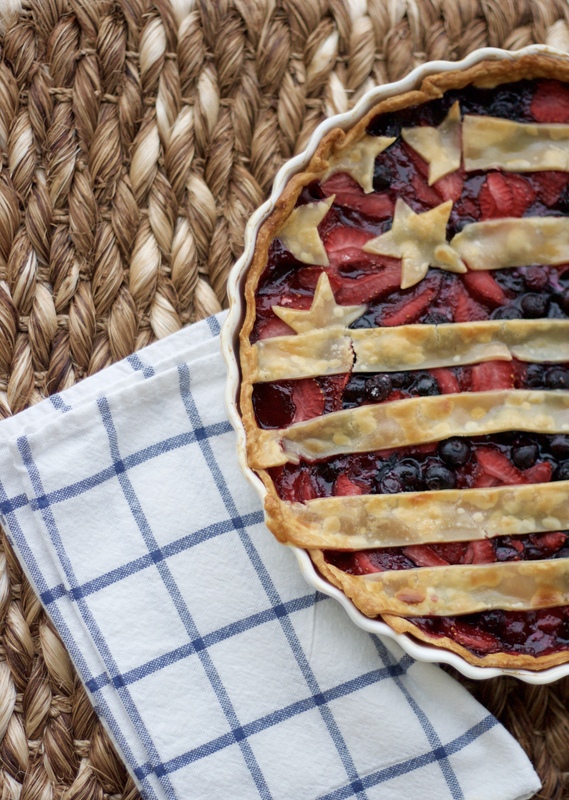 Stars and Stripes and berries galore. 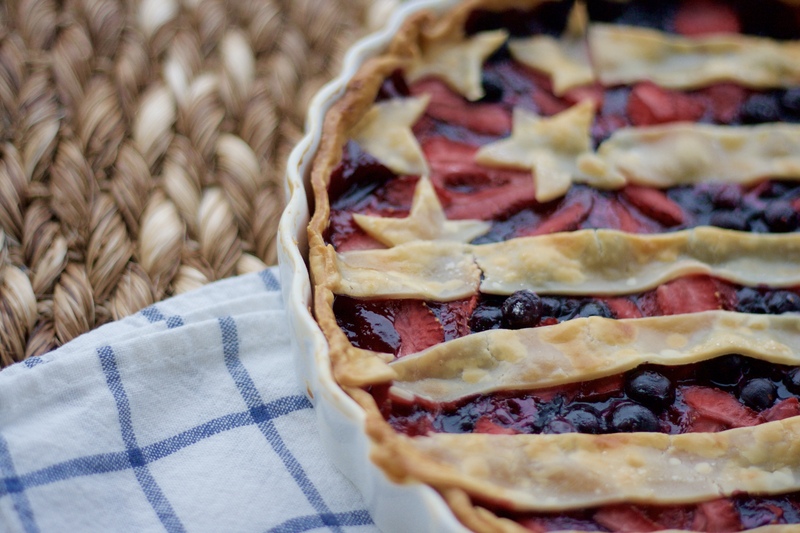 Monday, July 4, 4:30 p.m.
You decide that now’s as good a time as any to make a pie. Or a tart. 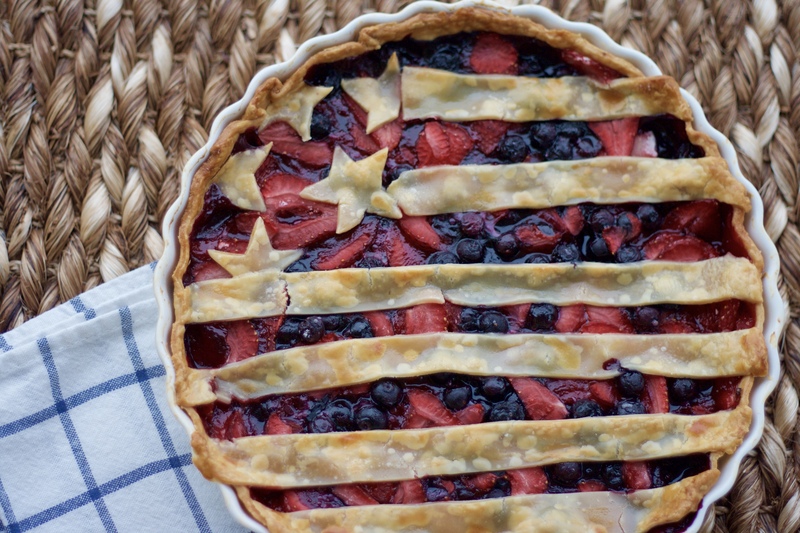 OK, something with crust and berries because you have both and not much more. 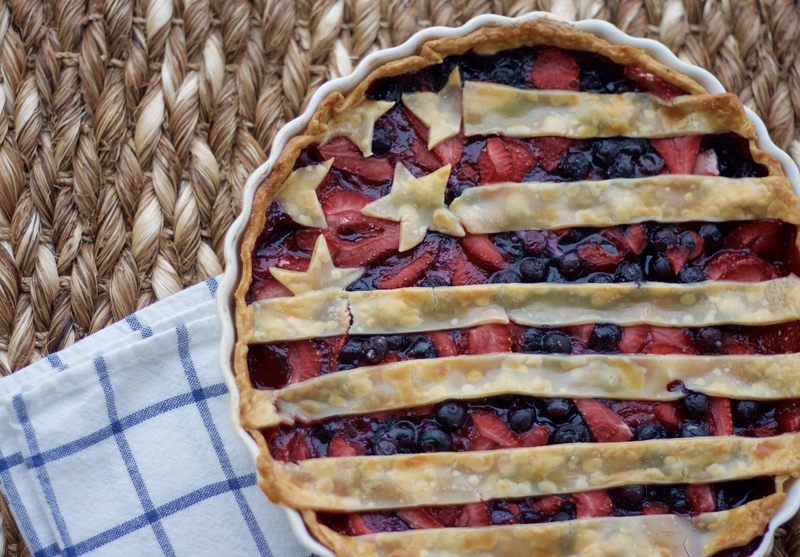 Googles recipes that include berries and pie crust. Most tart recipes call for a filling that requires cream cheese. You don’t have cream cheese. Or cream. Or any filling essentials really. You narrow your focus to pies. Googles recipes that include berries and pie crust and no cream filling. Monday, July 4, 5:30 p.m.
OK so now your’e making a pie but you’ve already pressed your crust into a tart pan. You already start brainstorming funny names for a tart+pie combo. Partie in the U.S.A.? Artie? Tie? Ok, but seriously you should probably just make the pie. You add the filling to the tart and end up with just enough extra dough for three stripes but no stars. Monday, July 4, 6:30 p.m.
You have to concentrate really hard to remember how to correctly carve a symmetrical star using only a paring knife. You are actually pretty impressed with your ability to carve a symmetrical star using only a paring knife. Snaps far too many photos of pre-baked pie for fear baking will completely disfigure your stars and stripes. Monday, July 4, 6:40 p.m.
Pie is in oven. Focus immediately shifts from design to taste potential. You’re now convinced that not only is it going to probably look like crap, but it may not taste good either. Did you even add sugar? Monday, July 4, 7:20 p.m.
Pietart is done and still resembles flag. Maybe you should blog this one. Takes hot pie outside onto hot patio to capture it with what little natural light is left. Monday, July 4, 9:30 p.m.
You finally taste pie and realize that you didn’t waste all your time taking photos of a pie that tastes like crap. Rinse and slice strawberries. Place rinsed berries in bowl and mix with cornstarch and sugar. Set aside. Roll pastry on mat until circle is a little larger than your pan. Press dough into prepared pan. Trim edges. Pour berry mixture into center of pan and spread out. 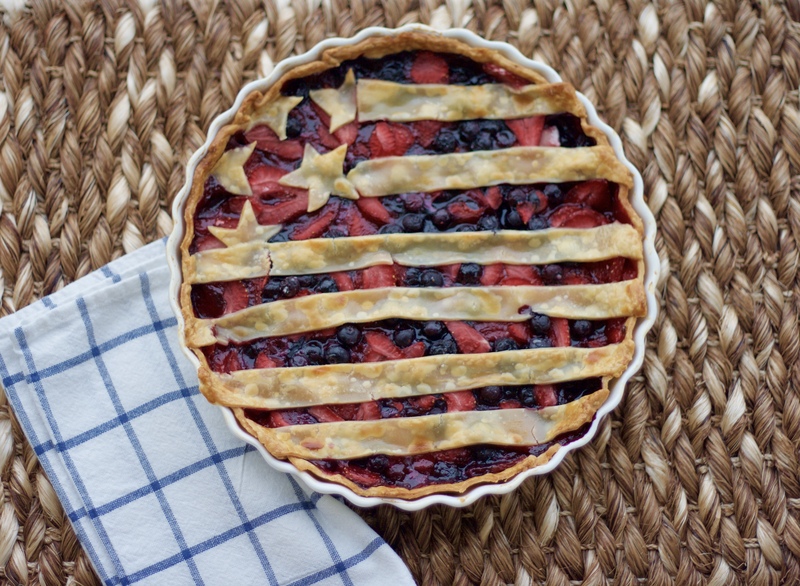 Trim remaining pastry dough into patriotic shapes. 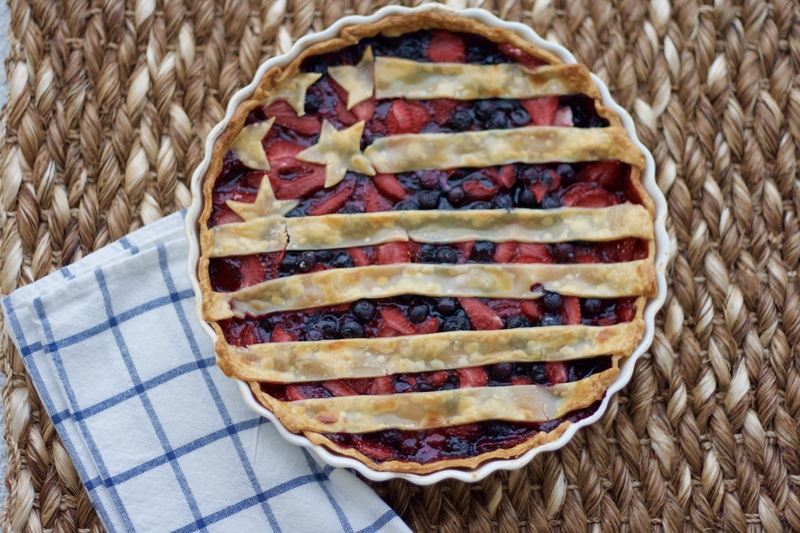 Place over berries and connect to edges of crust. In a small bowl, mix egg with water. Brush crust with egg wash. Sprinkle with remaining sugar. Bake for 40 minutes or until filling bubbles and pastry turns golden brown. Let cool for 10-15 minutes before serving. Hope that your readers don’t think you scheduled blogged this from your Pottery Barn desk weeks before the Fourth of July because now they know how randomly your blog posts originate. Thanks for following along anyways!